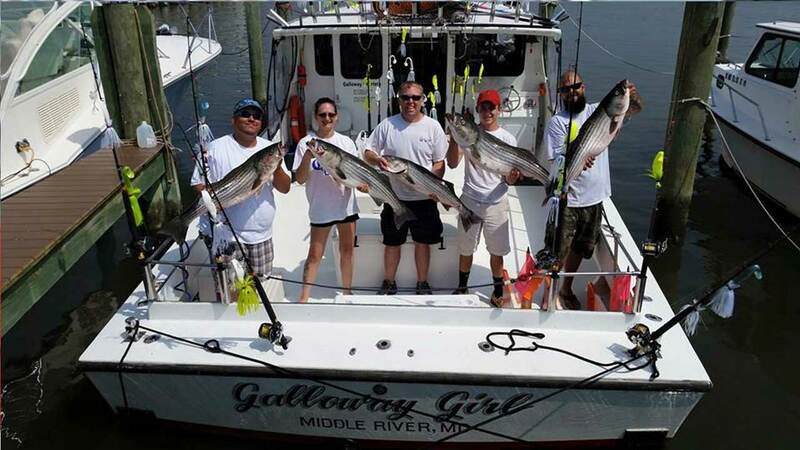 Galloway Charters specializes in catching rockfish (also known as striped bass). Captain Bob would almost solely fish for rock using the best methods for the time of season which include trolling, bottom bounce, chumming, live lining and jigging. At Galloway Charters, we’ll also run 15 minutes up to an hour to the best fishing grounds, the average is about 30 minutes. Children are more than welcome to come aboard. However, six is the maximum amount of passengers regardless of age. There are no exceptions. All licenses, rods, bait, tackle and ice for fish is included. There are NO surcharges for bait or fuel. No experience is necessary, we are professional and patient and willing to teach regardless of your experience level. Mate works for tips ONLY. A 20% tip is customary and appreciated . Excessive alcohol consumption will terminate your trip. Mate works for tips ONLY, 20% is customary and appreciated. $150 deposit required to hold your date.